I am inspired to write this post by Rachel’s post The Day I Woke Up. 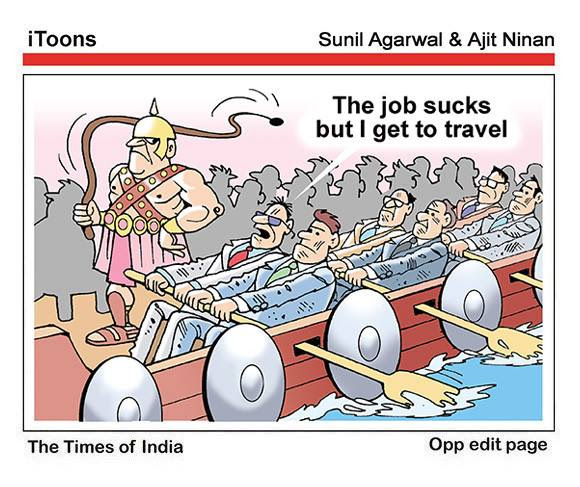 For the greater part of my working life, I had to travel extensively and when I finally retired, making the odd journey for pleasure was like new adventures. Even that has now stopped since the last three years due to health issues. Now at the age of 75, I lost my younger brother to cancer eight days ago. He was just shy of hitting 74 in two months’ time when he died. While my son and daughter in love were able to visit him and spend time with him , I was unable to due to my handicap. Many friends and members of my extensive family have been communicating their desire to visit with me soon and I suspect that they want to do this before I pop off. I keep telling them that I am not about to oblige any time soon but, who knows? When I look at my life now, I could not but agree with Confucius. “At fifteen I set my heart upon learning. The next trip that I make may well be the final one. 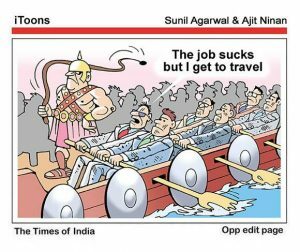 This entry was posted in Humor, Philosophy and tagged Ajit Ninan, Cancer, Confucius, Itoons, life span, Sunil Aggarwal, Times of India. Bookmark the permalink. I have commented a number of times in the past that if I’d known I was going to live this long I’d have taken better care of myself. I seriously never thought I’d get to almost 69 yet here I am. Next month I hit that mark. I am amazed at how many people who have never been heavy like me have been going through heart problems, some not surviving. I guess never having smoked a regular cigarette offset a one or more of those extra Xs in front of the L My gimpy knees are a hassle these days and I am simply not interested in a surgery of the length required to replace them. Should I win the lottery I am interested in 2 trips – London and Pune. I won’t hold my breath though as it has been said that without bad luck I’d have no luck at all. I will continue to hang out here in my tin castle in a trailer trash park and work on my family genealogy. That has been great fun. I’d say it’s part luck, but mostly our genes. It sure is food for thought how some people can abuse their bodies (by whatever means) and live to tell their great grandchildren about their heydays, and some of the clean living, risk averse, never having ridden a motorbike, never having climbed the highest mountains, swum a river, drop at fifty. By which I mean out of the blue. There was one example some time ago – and I was ashamed of myself because for a moment, just a moment, I thought to myself … – let’s just say it wasn’t the most charitable thought. A serious marathon runner biting the dust sometime in his forties. I thought these people who take their “fitness” very very very seriously, are evangelical about it, were supposed (and expected) to live forever. Anyway, should you make it to London please do let me know. Depending how soon this may materialize, I might have bitten the dust by then but please do visit my grave – I won’t be able to shake hands with you or give you a long overdue hug but it’s the thought that – in this case – does count and has to suffice. Since I am the praying kind, I shall pray every day that you get that lottery. I’m sorry to hear about your brother. Kaitlin made that extra trip early last month because of Andy, and she’s hoping to manage another weekend trip before the four of them come again around the end of the year. One foot in the grave, the other on a banana peel, there is no telling. PS I’m having to fill out my information in order to comment, the same problem you’re having on my site. Both of us must have committed the same sin! you will note also I’m swinging about CM at your site, no longer does it autofill the lines…also here is seems. I am sorry about that Catherine. Expert analysis confirms that it has to be fixed by WordPress. Nothing that my geek can fix. Thank you. Being a committed Vedantin, I am only too aware that all of us have to go one day and incidents like this and the post that I have linked to my post, only reaffirms what is common sense. I agree, it’s been common sense to me since I was a kid. I didn’t understand why people didn’t want to talk about it, so I developed my own philosophy and spiritual practice early in life. Thank you for introduction to Rachel’s blog. Unlike Confuzius I will not so much “suffer” as enjoy “perplexities” till the day I die. And never shall I be more perplexed than on THAT day. There are many reasons I regret that we have to die. One of them that when we have done so we won’t be able to reflect on the experience. Which is mildly annoying, or at least disappointing. Anyway, what are you talking about Ramana, “pop off”? What would I do without you? As far as I remember we never agreed a get-out clause. I am sorry to hear about your younger brother’s demise. Leaving your feelings for him aside, there is something strange about those younger than us dying. My mother (number five of seven children) is now the lone survivor among her siblings. She revels in her happy memories of them – and that is how they live on, for both her and me. Dancing to “Singing in the rain” – if only in our dreams. Remember? It is not only my younger brother who has preceded me to the hereafter. Many of my friends and colleagues from work have too. There is a joke that can apply to me as well. Toward the end of the Sunday service, the minister asked, “How many of you have forgiven your enemies?” Almost everyone held up their hands, but some were hesitant. So the minister then repeated his question. All responded this time, except one man, Walter Barnes. Watch out for my Friday 2 on 1 blog post. When we went to Wisconsin in May, we took along clothes suitable for a funeral as one of Karen’s aunts was very sick with little hope for survival for long. She was placed in a hospice near Green Bay. Instead of a funeral, though, we were able to visit her and I met one of Karen’s cousins and an uncle that Karen hadn’t seen in nearly 50 years. No matter the reason, having friends and family visit can be a blessing. I agree. Despite being flippant, I am looking forward to the visits. I offer my condolences on losing your brother. Were you able to Skype or have some kind of visual connection with him in his last days? I did indeed. He was more concerned about my health and that is what keeps coming back to remind me of his fortitude towards the end. Despite my being very flippant, I can assure you that I am looking forward to the visits indeed. And thank you. So very sorry Ramama on the loss of your brother, another spoke gone from the wheel, may your memories give you comfort. Like you I have lost far too many dearest friends to death, some in the peak of health unlike yours truly. Death is a strange one indeed, often snatching those who do everything in their power to prevent it. Though seriously when you look at intense runners they never look happy. Just stressed, eyes on the prize of bettering their time or getting a medal. A lot to be said indeed for meditation and knitting like I do. We have meditation in common and istead of knitting I have my crossword puzzles and books to keep me going till my comes. I am grateful for many of the good things that happen around me also. It’s not easy to see younger siblings die—I’m so sorry for your loss. I take my health very seriously, and hope that will not work against me! Thank you for the wonderful story of Mr. Barnes. No, it is not and I hope that none of my friends have to see that happen. It has happened a number of times within my family and apart from my recent experience, I know how the older siblings have taken to the deaths of younger ones. I love the Mr. Barnes story and never tire of sharing it at every appropriate occasion. say hello to Bob for me. I bet that they both are playing for the same soft ball team. Very sorry to hear about your brother. And as you say, melancholy is not the same as a sense of loss or facing up to reality. Thank you Nick. I hope that reading all the comments, my friend will relearn the meaning of melancholy. I was just talking to someone at the retreat centre about family – they were curious why I lived alone, and did I have siblings…Well once there was four, but the 2 in the middle, have gone…there is only the 92 years old (turned that number about a week ago) and me 25 years her junior….. I remember you mentioning the elder sibling before. That age difference still amazes me. I still have two younger siblings. One brother three years younger and a sister six years younger than I am. Can empathize with feelings of loss for a sibling and send you wishes for pleasant and fun-filled memories of your brother. My ten years older brother and only sibling died a couple years ago and I will always feel his loss. I had visited him a few years earlier (on Hawaii’s Big Island so couldn’t easily get there from the mainland), so I didn’t try to go his final days. Perhaps you and I can more easily picture in our mind’s eye our brothers as when we were last with them. FWIW Am having to fill in my name & info with each comment and at Cheerful Monk, too. Apparently all WP blogs are having this problem and I am told that another update is coming which will remedy this. We just have to be a little patient.